Every year about this time, I do a special piece for Hallowe'en. 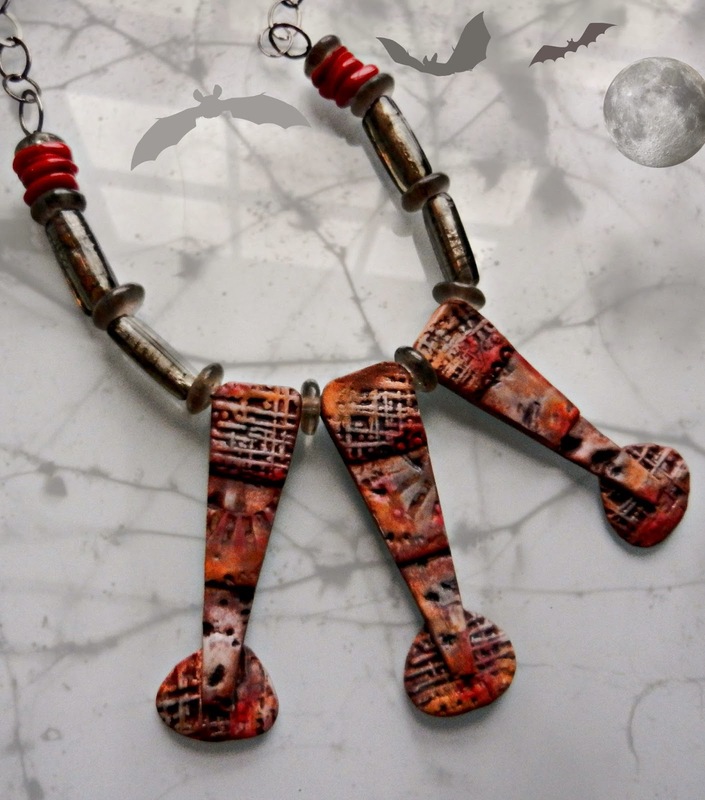 I've blogged about this in previous years, with various themes about color, scary talismans, and the Celtic celebration of Samhain. This year I'm fascinated with tattoos as art. In looking for inspiration for a new line of polymer jewelry elements, I bought a magazine last weekend featuring tattoo sleeve and wrist designs. The best work seems to be from coming from Europe-- lots of new techniques there, including watercolor styles and graffiti looks. While my class was working on their pieces at the recent 3-day Intensive at my home, I had a chance to try out some new textures on elements that I had made to demo techniques for them. I finally got them out to finish this week and I was struck by the graphic quality of the designs. I played around with different acrylic paints on them and got out some gray pastels, which I've been using a lot lately. Gray is a very unappreciated color but it really says “autumn” to me--gray skies, rainy clouds, deep sunsets. After adding some red for accent, I had the perfect urban/tribal piece, with colors that Count Dracula would love. A bit different from previous years but I like it and it will be very wearable with my winter wardrobe. Thanks to my new friend Diana Ptaszynski, who kindly added me to her Hallowe'en/Day of the Dead Blog Tour at the last minute. Be sure to visit all the other talented participants. This wonderful, spooky holiday only comes once a year! For the Blog Book Tour for Cindy Wimmer's first book - “The Missing Link” I decided to revert to what I do best, be it polymer or writing-- tell stories. When Cindy accorded me the great honor of writing the Forward to her new book, I had the happy task of re-visiting our friendship and how we first became aware of each other's work. To celebrate the publishing of her book, I'm going to show you some photos of my favorite Cindy pieces. Many of you may not know that I started my work in jewelry with bead stringing. I loved jewelry but had a pretty tight budget-- as a single woman with a mortgage--so I decided to make my own pieces. 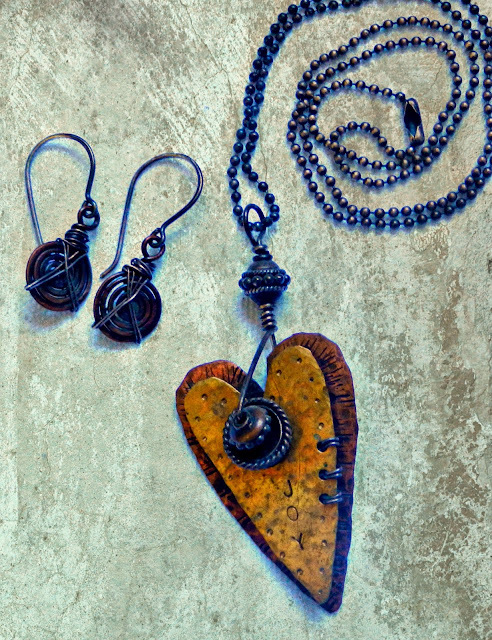 I found beads to string at the local Ben Franklin store and then started adding chain, wire and found objects. Eventually, I couldn't find the beads I wanted so I started making them with polymer clay. 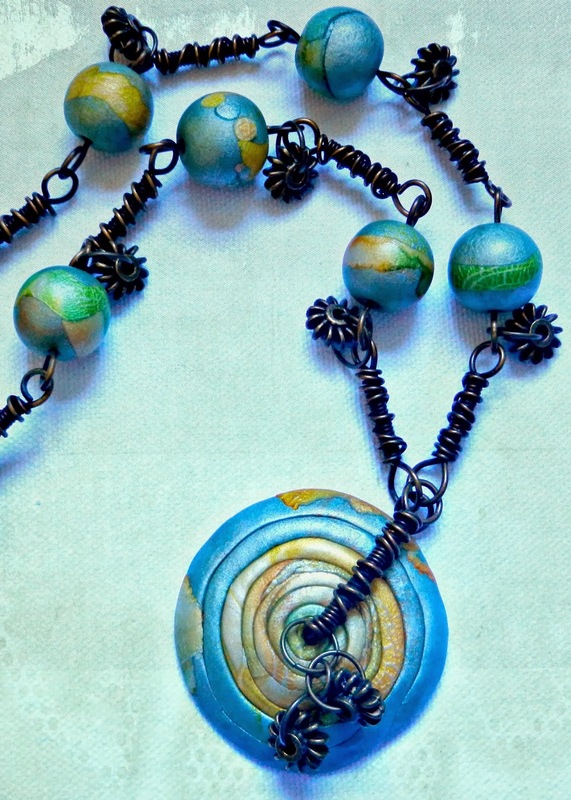 About that time I decided that polymer beads could be greatly enhanced by more coherent design and wire skills so I was determined to learn more about what made a great necklace. Chain and wire seemed important to the final look so I started buying the “Step by Step Wire” and “Easy Wire” magazines to find more instruction and ideas. I kept seeing the same contributor turn up in each issue-- “Cindy Wimmer”-- and noticed all the pages I tore out of my magazines to keep and study were her designs. 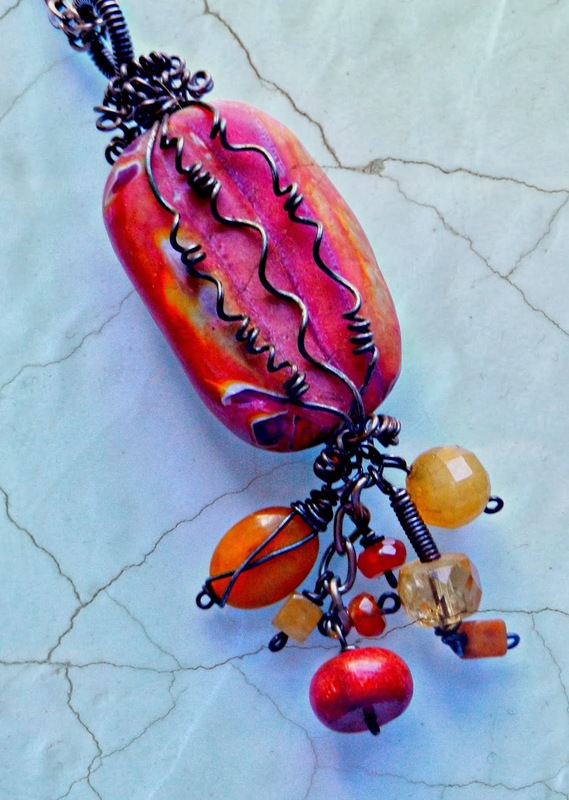 Finally, one day I left a comment on her blog and won one of Cindy's pendants, “Joy”. At the time I was at a difficult place in my life and this little pendant kept me going with its hopeful message. I bought a pair of Cindy's earrings to go with it and they are still my go-to everyday earrings, just copper wire twisted into one of Cindy's simple, iconic designs. 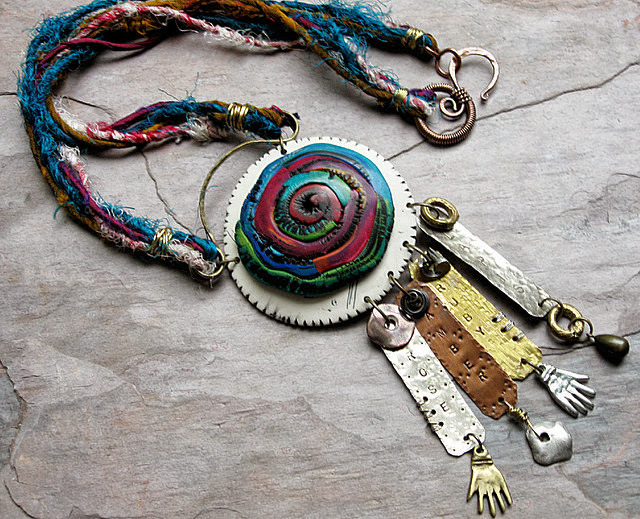 So we began corresponding about life, jewelry and everything else and in August 2009 we did our first collaboration for a contest called “Summer's Colors” on Susan Lenart Kazmer's blog. Cindy stamped the names of each of the colors onto a unique metal pendant and I did my polymer color thing with the focal bead. I still love this piece. When I first started making polymer beads, I started noticing that few well-known wire artists used them. One actually told me that people liked beads that were “more natural”, like gemstones or lampwork. Cindy had no hesitations at all about using my polymer beads in her projects that were featured in national magazines and popular books. In fact, she championed them with editors. I was thrilled that her wire could so enhance the beads I was making and show other jewelry stringers that polymer was a design force whose time had come. 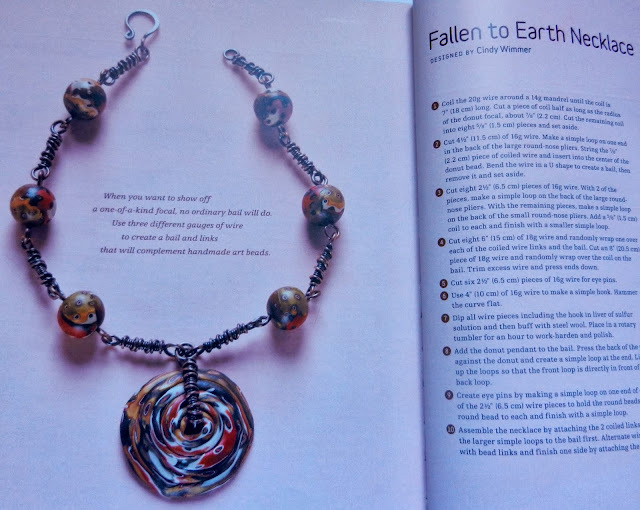 Cindy's tutorial in "Wire Style II" - "Fallen to Earth"
My version of Cindy's piece from "Wire Style II"
I kept seeing Cindy's work and design style evolve over the next couple of years and was not surprised at all when she told me her book proposal had been accepted by Interweave Press. Cindy's wirestyle always surprises me with its classic yet bold curvatures. I see tribal echoes in them, which I appreciate more than coy filigree and dainty curlicues. Yet it's adaptable to pearls and antique elements as well. I don't know how she does it but you will appreciate her thoughtful and thorough approach when you set your pliers to the wire and start to form her designs. 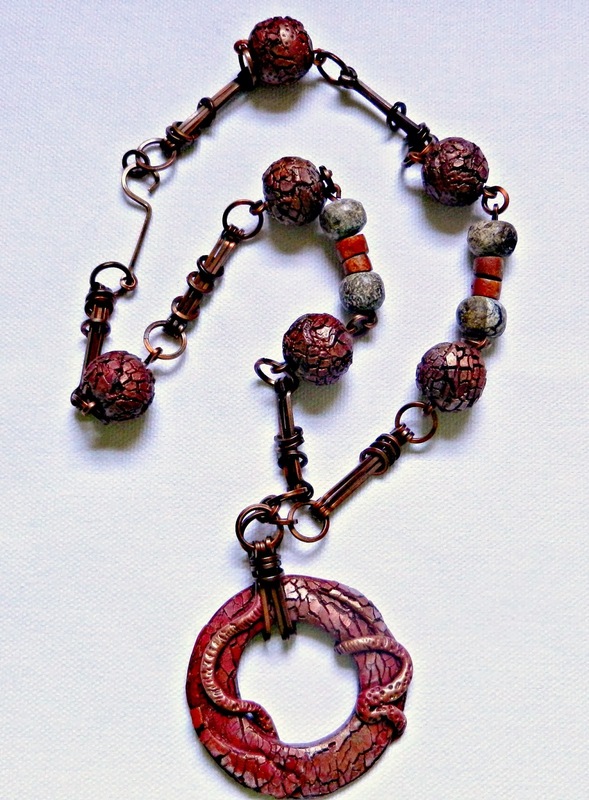 I chose the bold look of the Sliding Rings link to pair with my rugged polymer “Molten” beads. I could see some mid-century shapes complementing this link as well, something in the style of Matisse perhaps. The thing is, Cindy's links make you think. Of new designs. Of pairings you never would have imagined. Of fabulous chains. Of possibilities. And for me, that's the best kind of book. Leave a comment including your e-mail address on this post to be entered into a drawing to receive a copy of “The Missing Link”. Then go to Cindy's blog www.sweetbeadstudio.com for more chances to win giveaways and to find links to all the other posts about “The Missing Link” by the other contributors. I will randomly draw a number at the end of the day on the 20th from the comments below and pass the winner along to Cindy. She'll announce the winners on October 21st and the winners will receive their books shipped directly to you from the publisher.